Sentera real-time plant health solution and crop scouting tool is being used by agronomist, crop advisors, and growers around the world to improve decisions both on and off the field. Sentera NDVI crop health sensors are compatible with nearly all drone platforms including the DJI Phantom 4 pro, Mavic, Inspire and Sentara Omni. Sentara offers drones sensors and easy to use AgVault web desktop and mobile software with an autonomous flight app that lets you fly the drone to capture data and then view the data offline at the field's edge. The entire system can be up and running and actively collecting data in under 50 seconds making scouting your crops as easy as in 3 steps. Simply, unpack and setup your drone fitted with centers NDVI single sensor which allows you to view plant health invisible to the human eye. Open the AgVault mobile app on your iOS device, highlight the flight area by selecting the field corners and set the flight specifications for your mission. Simply, press the start button and your drone is off capturing images of your field, flying autonomously without any manual guidance needed. It will even come back to you automatically. If it needs a new battery and then pick up right where it left off. During the flight, your precise drone using its NDVI plant health sensor will capture both RGB and Near-Infrared (NIR) images. This NIR imagery is what allows you to produce true NDVI data. Upon completion of the flight your drone will return home and land the NIR data is stored on the green sensor and your RGB data is stored on the drone sensor. To import the data you've just captured, simply remove the SD cards and insert them into the computer, to upload the data to send terra's AgVault software. Remember AgVault is fast in less than 30 seconds over 150 images can be uploaded. Next use AgVault to turn these images into actionable plant health data right at the field's edge. AgVault allows you to easily view health insights immediately after flying and without an internet connection. In fact, you can generate quick tile maps to view a complete snapshot of your field plant health in less than two minutes or if you prefer you can order fully stitched mosaics directly through AgVault. Sentera a crop scouting solution allows you to instantly and easily view crop health with highly precise NDVI readings, plus gains even richer plant health insights by easily layering historical data sets to analyze plant growth and progression over time. What's more, AgVault also allows for integration and use of your data with all major digital agriculture platforms, plus you can generate an export data directly to your existing tools, even to the cab of your tractor add multiples ground inspection provides another layer of precision. Allowing you to take photos with your mobile device, each photo is automatically geotagged and then sync to your AgVault account. Once you're within Wi-Fi range AgVault instantly syncs with the cloud and you can quickly and easily share your data with trusted advisors, growers or clients. 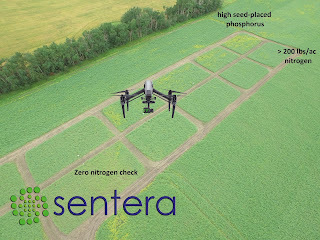 0 Response to "Sentera for Crop Scouting Solutions"